There are a variety of factors that affect the spectrum of X-rays produced in a diagnostic imaging unit. This model shows the effect of varying the high voltage (kVp), added filtration and ripple in the high voltage supply to the X-ray tube. The physical mechanisms by which X-rays are produced are Bremsstrahlung (in which collisions of the cathode electrons convert some of their energy into X-ray photons) and characteristic X-rays (in which the cathode electrons kick an inner shell electron out of an atom, and an X-ray photon is release when one of the atom's outer shell electron transitions to the inner shell). Changing the accelerating voltage of the cathode electrons (i.e. changing kVp) affects both mechanisms of X-ray production. Adding filtration to the X-ray beam reduces its intensity, but does not reduce all energy X-rays equally. Finally, voltage ripple actually causes the accelerating voltage of the cathode rays to vary below the peak voltage (kVp), so that X-ray tube is essentially averaging over a range of high voltages up to the set kVp. The total X-ray energy is the area under the spectrum curve. What effect does changing kVp have on the total energy of the X-ray beam? With kVp set at 120 kV, add filtration by setting the following characteristics of the filter material: atomic number (Z) =1, density (ρ in g/cm3) = 1 and thickness (d in cm) to 1. What happened to the overall intensity of the beam? (i.e. the area under the curve). Were all energy X-rays equally affected? Which part of the X-ray spectrum was affected the most? What happens to the total intensity of the filtered beam and the spectrum when Z is increased? What happens when the density is increased? Is this the same effect as increasing Z? What happens when the thickness is increased? Remove the filters by setting all filter parameters to zero, and then increase ripple. 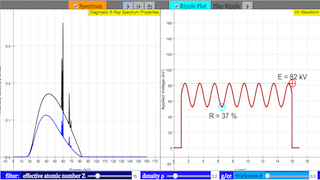 The ripple in the high voltage waveform can be seen by selecting the "Ripple Plot" checkbox. What happens to the total intensity when ripple is increased? Which part(s) of the X-ray spectrum are affected the most? © 2018, Creative Commons Attribution-Noncommercial-Share Alike 3.0. This applet uses a very simple model for the X-Ray spectrum. * The bulk of the spectrum is due to Bremsstrahlung while the reminder is from the characteristic X-Rays. The spectrum is further shaped by intrinsic filtering by the anode materials (since the X-rays are generally created beneath the surface of the anode). There are a variety of factors that affect the spectrum of X-rays produced in a diagnostic imaging unit. This applet shows the effect of varying the high voltage (kVp), added filtration and ripple in the high voltage supply to the X-ray tube. The physical mechanisms by which X-rays are produced are Bremsstrahlung (in which collisions of the cathode electrons convert some of their energy into X-ray photons) and characteristic X-rays (in which the cathode electrons kick an inner shell electron out of an atom, and an X-ray photon is release when one of the atom's outer shell electron transitions to the inner shell). Changing the accelerating voltage of the cathode electrons (i.e. changing kVp) affects both mechanisms of X-ray production. Adding filtration to the X-ray beam reduces its intensity, but does not reduce all energy X-rays equally. The details of how the filter interacts with the X-Ray beam depends upon several properties of the filter: the effective atomic number Z, the density ρ and the thickness d.
Changing Z will produce a qualitatively different change in the spectrum compared to ρ and d.
Finally, voltage ripple actually causes the accelerating voltage of the cathode rays to vary below the peak voltage (kVp), so that X-ray tube is essentially averaging over a range of high voltages up to the set kVp.